STT (speech-to-text) features enable recognizing sound data recorded by the user and sending the result as text. 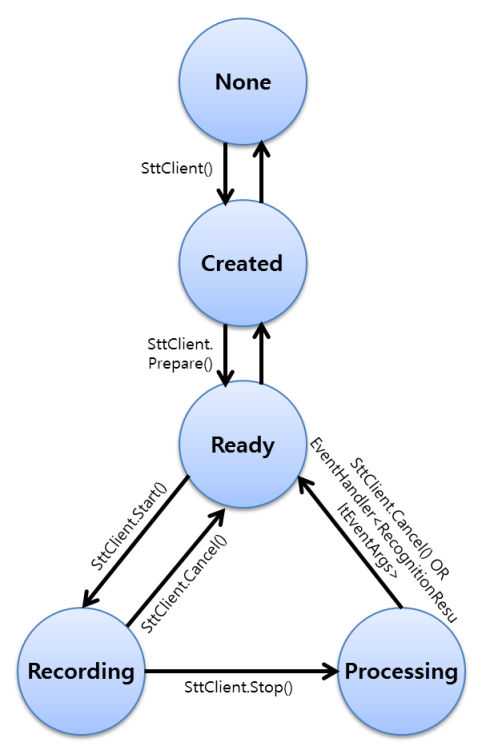 When your application creates a handle and prepares the STT service, the STT daemon is invoked and connected for background work. This daemon and your application communicate as the server and the client. You can connect the background STT daemon to be able to operate STT. The basic processes allow you to register event handlers, control the recording, and set options. You can also set STT parameters. You can get information that includes, for example, language and state. Create a handle and register event handlers. Create an STT handle, which is used for distinguishing your application from other applications also using STT. Get notifications on state changes, language changes, recognition results, and errors by registered event handlers. Start, stop, and cancel recognition. Start recording the user voice by microphone and analyze the recorded data as text. If you stop the recording manually, STT stops the recording and recognizes the sound data. The recognized text is then sent by the registered event handler. You also can set sounds which are played before STT recording starts or after it stops. The recognition result is sent by the registered event handler. With a specific STT engine, you can obtain the time stamp information for the recognition result. Some STT engines send the recognition result partially during the user recording. You can get the result information using the parameter of the recognition result event handler. The STT life-cycle is described in the following figure. The credential is a key to verify the authorization for using the STT engine. The necessity of the credential depends on the STT engine. If the STT engine requests the credential, you can set it using the SetCredential() method of the Tizen.Uix.Stt.SttClient class. The private data is a setting parameter for applying keys provided by the STT engine. Using the SetPrivateData() method of the Tizen.Uix.Stt.SttClient class, you can set the private data as the corresponding key of the STT engine. Get the current STT state. The state is also applied as a precondition for each method. You can start recognition with the language that you want as a parameter of the Start() method of the Tizen.Uix.Stt.SttClient class. However, if you do not set a specific language, STT starts recording and uses the default language for recognition. The user can change the default language in the device settings, by modifying the display language or the STT default language status. If the display language is changed to a non-supported one, the STT language is changed to UK English. Get a list of the supported languages to check whether the language you want is supported. Get a list of the supported engines and the selection of current engines. Additional features, such as silence detection and partial result, are provided by specific engines. Get the error message when the error event handler is invoked. Get private data from the STT engine. To use the STT library and create an STT handle, create a new instance of the Tizen.Uix.Stt.SttClient class. The instance is used to launch other STT methods. After the instance has been created, the STT state changes to Created. Note STT is not thread-safe and depends on the Ecore main loop. Implement STT within the Ecore main loop and do not use it in a thread. Note Do not use the Dispose() method inside an event handler. Within an event handler, the Dispose() method fails and invokes the OperationFailed error with the ErrorOccurred event of the Tizen.Uix.Stt.SttClient class. STT provides event handlers to get various information, such as the recognition result, state changes, language changes, and errors. You can only register event handlers when the STT state is Created. Retrieve the current STT state by using the CurrentState property of the Tizen.Uix.Stt.SttClient class. The STT state is changed by various STT methods, and it is applied as a precondition for each method. You can get a notification about default language changes by registering an event handler for the DefaultLanguageChanged event of the Tizen.Uix.Stt.SttClient class. Retrieve or set the current engine for STT recognition by using the Engine property of the Tizen.Uix.Stt.SttClient class. The supported language, silence detection, and supported recognition types depend on the STT engine. Check whether a recognition type is supported by the current engine, by using the IsRecognitionTypeSupported() method of the Tizen.Uix.Stt.SttClient class. Use the values of the Tizen.Uix.Stt.RecognitionType enumeration as a parameter. The normal recognition type, Stt.RecognitionType.Free, means that the whole recognition result is sent at the end of the recognition process. The Stt.RecognitionType.Partial recognition type is used to get a partial recognition result. After you have initialized STT by creating the Tizen.Uix.Stt.SttClient class instance, connect the background STT daemon with the Prepare() method of that class. The method is asynchronous and the STT state changes to Ready. Note If the error event handler is invoked after calling the Tizen.Uix.Stt.SttClient.Prepare() method, STT is not available. Set and get the private data. The private data is a setting parameter for applying keys provided by the STT engine. To set the private data and use the corresponding key of the engine, use the SetPrivateData() method. Note The key and data are determined by the STT engine. To set and get the private data, see the engine instructions. After STT starts recognizing sound, some STT engines can detect silence when the sound input from the user ends. If the silence detection is enabled, the STT library stops recognition automatically and sends the result. Otherwise, you can manually stop the recognition process using the Stop() method of the Tizen.Uix.Stt.SttClient class. To set the silence detection state, use the SetSilenceDetection() method, using values of the Tizen.Uix.Stt.SilenceDetection enumeration as a parameter. If you set the silence detection as SilenceDetection.Auto, STT works according to the global STT setting. This option must be set when STT is in the Ready state. Set or unset the start sound. To play a sound before STT recognition starts, call the SetStartSound() method in the Ready state. Note The sound file path must be a full path. Only WAV format sound files are supported. Set or unset the stop sound. To start recording, use the Start() method. The connected STT daemon starts recording, and the STT state is changed to Recording. Note If the Start() method fails, check the error code and take appropriate action. The language and recognition type must be supported by the current STT engine. If you set NULL as the language parameter, the STT default language is used based on the DefaultLanguage property of the currently-used Tizen.Uix.Stt.SttClient class instance. While STT recording is in progress, you can retrieve the current recording volume using the RecordingVolume property of the Tizen.Uix.Stt.SttClient class. The volume value is retrieved periodically with the short-term recorded sound data as dB (decibels). The STT volume normally has a negative value, and 0 is the maximum value. To stop the recording and get the recognition result, use the Stop() method. The recording stops and the STT state is changed to Processing. When the recognition result has been processed, the RecognitionResult event triggers, and the state changes back to Ready. To cancel the recording without getting the result, use the Cancel() method. The STT state changes to Ready.